The “near unlimited” choice of online TV means that viewers need tools to make content easier to use, with 60% of people agreeing that they need a ‘universal listing’ that lets them find shows across all TV sources, according to new research. US-based Hub Entertainment Research found that 48% of respondents said they are more likely to choose entertainment sources that make discovery of new shows easy, compared to 9% who weren’t. 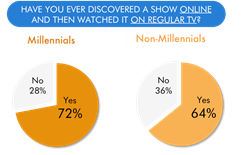 The Conquering Content report found that 61% of viewers and 72% of millennials have watched a show on live TV that they first discovered and watched online. Among Netflix and Hulu Plus subscribers, this proportion was even higher, at 68% and 73% respectively. According to the research, 81% said that thanks to new TV options, more of their viewing time is spent on TV shows they “really like” than was the case in the past. Some 29% also said they only try a new show if they’re sure they’ll like it. “The bottom line is that consumers are now realising both the benefits and the challenges that come with massive amounts of content available instantly. Even the choosiest consumer can find more of their favourite types of content than they have time to consume. But almost unlimited catalogues mean that viewers need, and increasingly expect, tools to make discovering shows they’ll love a manageable task,” said Jon Giegengack, co-author of the study. The findings were based on an annual tracking study of 1,250 US TV viewers with broadband. Hub Entertainment Research collected the data in November 2014.